Each coffee is different: for example, there is Robusta and Arabica coffee. What is special about the Solino coffee project? How much are people paid and where do the coffee beans grow? How fresh is the coffee and how much caffeine contains our Espresso and Caffè Crema? Here you find answers to your questions. If you have additional questions, please contact us! 1. What is special about Solino Coffee? Processing at the origin. Solino is processed at the origin in Ethiopia. 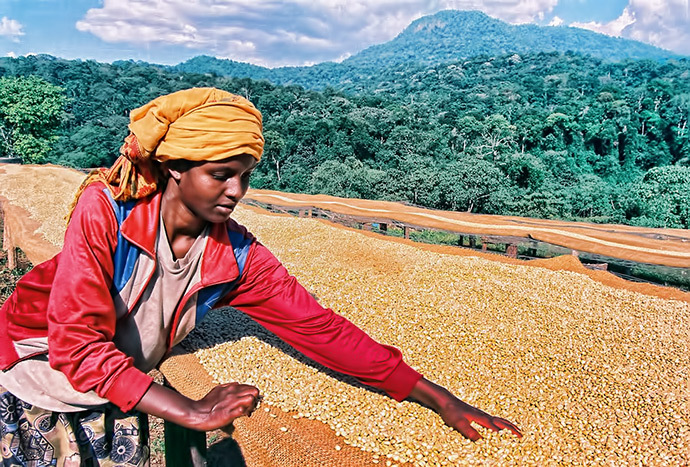 Roasting and packing at the origin helps Ethiopians to receive more money for their coffee (approximately 60% more compared to green coffee export). As the processing requires qualified jobs (roast-masters, printing experts), Solino pays 3-6 times higher than average salaries: 60 – 120 Euro / month compared to a salary of a coffee farmer which is 20 – 30 Euro / month. The Greenpeace Magazine has described Solino as “Fairtrade – Plus” (Link zum Artikel). Actually, only in 2008 the European Union stopped the 30% custom duty on roasted coffee for the most underdeveloped countries (ACP – countries). Green coffee was always imported tax free. In this way, Germany became the 5th biggest exporter of coffee in the World. Sundried Coffee. We mostly use sundried coffee. Compared to the washed coffee, the sundried coffee is usually a bit less acid and has a more earthy taste (please see also question 11). 2. What are the advantages of roasting coffee directly in Ethiopia? its dependency on exporting only raw materials and farming. Less traders and wholesalers between coffee farmers, roasters and consumers. 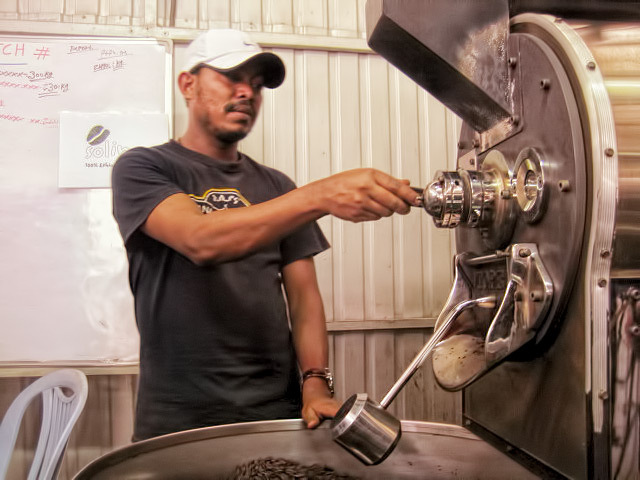 Direct access to freshly harvested green coffee at the origin (it is also important that the green coffee is fresh). Lower labour cost in Ethiopia, even when the salaries paid are significantly above the country average. 3. What are the disadvantages of roasting coffee in Ethiopia? Time of transport after roasting. The transport from Addis Ababa via Djibouti to Bremerhaven takes about 25 days per seafreight. From our experience, this is not a significant problem. Training and organisation in Ethiopia. Producing a final product which can be delivered directly from Ethiopia to European supermarkets requires a lot of attention to details. Perfect printing quality with readable EAN Codes, constant quality of roasting, perfect quality of packaging including outer boxes. Frequent electricity cut-offs even in the capital of Addis Ababa. This leads sometimes to delivery delays and out of stocks. Less processing for the coffee industry in Europe. 4. Why coffee from Ethiopia? The historic origin of coffee is located in a small village called Kaffa, south of Addis Ababa the capital of Ethiopia. Today, Ethiopian highland Arabica is valued as second to none. 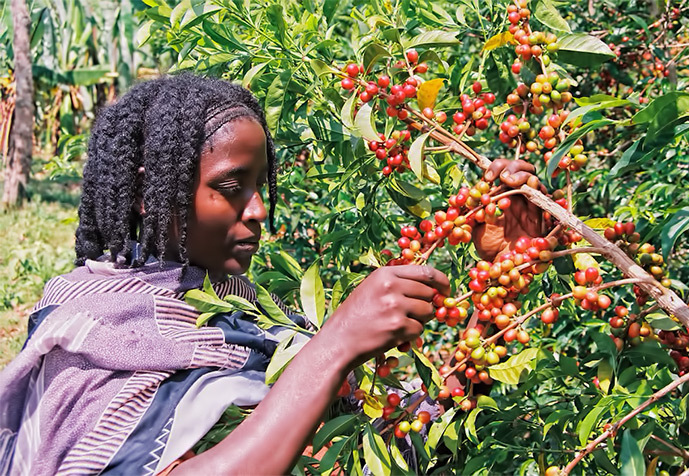 The combination of cool highland climate, excellent soil condition and a century old culture of growing coffee (50% of the Ethiopian coffee is consumed by the local population) leads to an exceptional coffee quality. 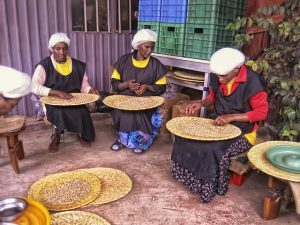 As Ethiopian coffee is also one of the most expensive kinds of coffee in the World, it is usually added only in small quantities to improve the taste. The most famous areas of coffee plantation are located in the regions of Yirgascheffee, Sidamo and Harar. 5. Where exactly is the Solino Coffee roasted? employees were trained and employed, earning better paid salaries. 6. Why does Solino Coffee does not have a organic certificate? Ethiopian coffee farmers usually do not use and fertilizers, also because they could not even afford it. To receive an organic certificate from the EU, farmers would need to pay around 6000 €. These fees must be paid for consultants and auditors from Western countries. However, the goal of Solino is to ensure that more value stays in Ethiopia. Therefore we consciously abstain from obtaining an organic certificate. 7. Why is Solino not fairtrade certified? Fairtrade programs have the goal to give more money to coffee farmers. 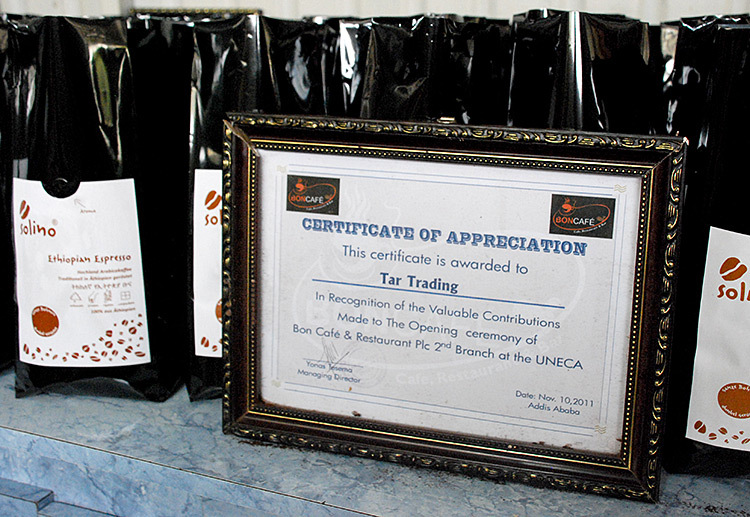 Similar to organic certifications, it is also expensive to receive fairtrade certifications (approx. 5000 € when we checked last time). 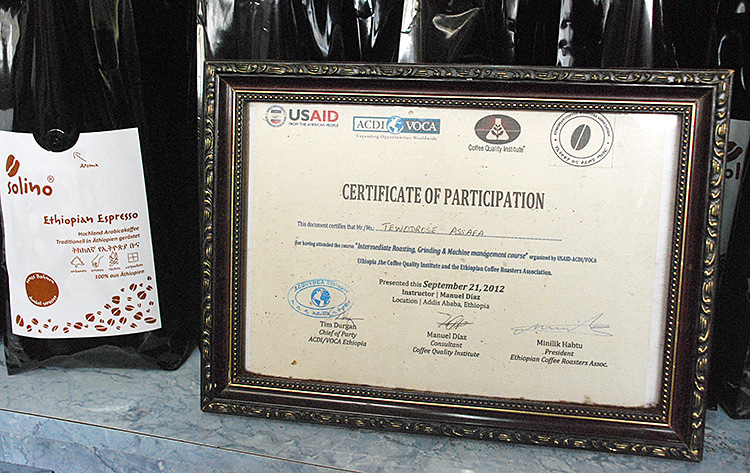 Fairtrade certifications are mostly given by certification agencies, usually from Europen countries. With Solino we want to ensure that Ethiopians receive the maximum for their coffee. We focus on the roasting and packing in Ethiopia. With every kilo of roasted coffee, the country earns 60% more when compared to the export of raw green coffee. The value addition process requires qualified jobs. For example, coffee roasters and printers earn around 3 – 10 times more compared to the average salary of a coffee farmer. The German Greenpeace Magazine describes Solino as “Coffee fair plus” (link to article). 8. Why is Solino Coffee expensive? Generally the Ethiopian Arabica coffee is one of the most expensive Arabicas in the World. Probably because the coffee growth at a very high altitude above 2000 Meter and each coffee tree carries much less coffee berries than in other countries. However, the taste of the berries grown in high altitude is more intense. Solino Coffee is a handroasted coffee. Each roast batch contains only 15 – 30kg and the roast time is very long (18 minutes) at 210 degrees Celsius. In addition we need 12 minutes to cool the coffee beans. This process is much more work intensive compared to an industrial coffee roast which takes only 90 seconds at a temperature of up to 600 degrees. 9. Why is Solino Coffee cheap? As we buy and roast our coffee directly in Ethiopa, we do not need any wholesalers, importers or traders. 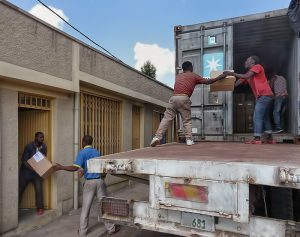 Even large scale roasters usually buy from coffee traders, not directly from the Ethiopian Coffee Exchange in Addis Ababa. The work intensive handroasting is cheaper in Ethiopia, even though we pay above average salaries (see also question 6 above). 10. Where exactly grows the coffee for Solino and under what conditions? 11. What is the difference between Arabica and Robusta coffee? Certainly the taste! Arabica coffee is much more intensive and has a larger variety of flavours. Ethiopia only grows Arabica coffee. It grows in the highlands at an altitude of above 2000 Meters. As Arabica trees carry much less coffee berries than Robusta trees, it is around 2-3 times more expensive. 12. What is the difference between sundried and washed coffee? There are 2 ways to treat coffee after the harvest: Sundried coffee is dried in the sun and the seed of the coffee berry is separated from the fruit during this drying process. Washed coffees are mostly used for exports. Usually, sundried coffees have a stronger taste and they are usually kept for the Ethiopian national market. For Solino we prefer to use sundried coffee. 13. How can you judge different coffees? Acidity: Generally one can say that a darker roast level contains less acidity. Some aciditiy is however very important for a balanced taste. Too much acidity is, on the other hand, a sign of high temperature roasting for a short time. Therefore we roast our Solino Coffee for 18-21 minutes at a temperature of only 210 degrees. During the long roast, the flavour can fully develop and the unwanted acidity that derives from tannin is eliminated. Usually, the sundried coffee used by Solino also contains less acidity compared to a washed coffee. Body: This describes the “mouth-feel” of the coffee. A full, creamy and round taste is desired. We try to obtain this also because we use sundried coffee. Flavour: As for wine, coffee has also an endless amount of different flavours. In addition to the typical taste of coffee, these are chocolate, berry, citrus and spice. A maximum of flavours means usually the best possible taste. Smell: A good smell is also very important. It depends as well from the kind of coffee and the roasting process. The fresher the coffee (not only the roasting, but also the green coffee bean) the better the smell. Here you will find a taste description of all Ethiopian coffees. 14. What is the difference between light and dark roasted coffee? Coffee roasters are using the “Agtron Colour Table” (Link to the Website of Agtron), to define the level of roast. Dark roasted coffee has a stronger taste and has less acidity. In Ethiopia (just like in South of Italy), people usually prefer dark roasted coffee with an intense taste. Light roasted coffee has a less strong taste, but it is easier to distinguish the different flavours. It also contains a bit more fruit acidity. Solino Espresso (Agtron 35-40) and Solino Caffè Crema (Agtron 40-45) are slightly darker roasted compared to an average roast level in Europe. 15. How much coffein does Solino Coffee contain? Solino is made only from Arabica coffee beans. Arabica contains generally less coffein compared to Robusta coffee. Also the darker roast of Solino reduces the amount of coffein compared to lighter roasted coffee. The longer coffee is roasted and the darker the colour is, the less it contains coffein. Also the Solino Caffè Crema is roasted darker than normal filter coffee. Therefore it contains relatively little coffein. 16. Why does Solino Coffee not always taste exactly the same? We buy our coffee always from the same areas of Illubabor and Jimma. The beans are not always exactly the same from one harvest to the next. Our roast masters in Addis Ababa are adapting the roast level to each harvest in order to achieve the best possible taste result. This means, that colour and also taste can vary a bit. In addition, all our coffees are roasted by hand. Such a hand roast can never be compared to a fully standardized industrial roast. 17. How does the Solino Coffee stay fresh? The packaging and the storage are most important. After the roasting, coffee beans still contain gas which evaporates for few days. We use this effect and fill our coffee directly after roasting into a special pack with a one way valve (this special packaging material still does not exist in Ethiopia and we need to import it from Europe or India. We work on finding an Ethiopian producer also for this bag). The gas that still evaporates from the beans is now pushing the remaining oxygen out of the pack. Protected from oxygen, light and humidity, our coffee can stay fresh for 20 months. After the opening at home, please keep the coffee in the original pack and close it well. The biggest “enemies” of roasted coffee are oxygen, high temperature, light and humidity. 18. 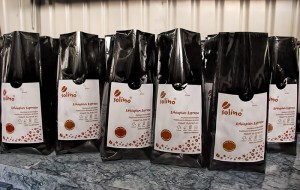 Is Solino Coffee still fresh when it arrives in Europe? Our coffee is shipped by sea containers. Directly after roasting, the coffee is shipped from Addis Ababa to Djibouti, this takes around 24 hours. From there the container is loaded to a vessel that takes around 3-4 weeks to arrive in Bremerhaven (North of Germany). Directly from our warehouse in Hamburg, the coffee is shipped to the supermarkets or to your home. As we order every 6 weeks, the coffee shall not be older than 10 weeks after roasting when it arrives at your home. This amount of time is not a problem if the coffee is well packed and stored.